Though unfortunate, it's got drama, intrigue, complex characters, suspense, policy, law and order - but it's not The West Wing (which I miss) but the Hawaii Public Utilities Commission's commissioner appointment process. Who would have thought this once obscure, little understood agency steeped its own esoteric language and proceedings is now in the national limelight with Wall Street and everyone else waiting with bated breath. And though unfortunate, it is a great opportunity for a civics lesson to understand the separation of powers, the hierarchy of laws, the delegation of authority, the role of regulation, the making of policy and, ultimately, figuring out how far a State agency can intrude into a business transaction between two private parties under the guise of protecting the public interest and whether facts, logic, reason and the rule of law will prevail or succumb to an abuse of power. Except as otherwise provided in this constitution, whenever a board, commission or other body shall be the head of a principal department of the state government, the members thereof shall be nominated and, by and with the advice and consent of the senate, appointed by the governor. The term of office and removal of such members shall be as provided by law. Such board, commission or other body may appoint a principal executive officer who, when authorized by law, may be an ex officio, voting member thereof, and who may be removed by a majority vote of the members appointed by the governor. (a) There shall be a public utilities commission of three members, to be called commissioners, and who shall be appointed in the manner prescribed in section 26-34, except as otherwise provided in this section. All members shall be appointed for terms of six years each, except that the terms of the members first appointed shall be for two, four, and six years, respectively, as designated by the governor at the time of appointment. The governor shall designate a member to be chairperson of the commission. Each member shall hold office until the member's successor is appointed and qualified. Section 26-34 shall not apply insofar as it relates to the number of terms and consecutive number of years a member can serve on the commission; provided that no member shall serve more than twelve consecutive years. Each member shall hold office until the member's successor is appointed and qualified. advisory letters on this subject. However, an Attorney General Opinion has more force and weight than just an advisory letter. So I'll refer to Attorney General Opinion 80-4 which is on point with regard to this situation. As the Opinion points out, this issue is well-settled and not something we have to have a Hawaii specific precedent as the current attorney general's letter seem to imply. Drama - Ironically, we have a reprieve with the 4th of July weekend when we celebrate the colonies' separation from the British and embarked on the founding of our country, one based on democracy and the rule of law. Come Tuesday and in the following days, we will see whether the rule of law will be pursued or ignored in two possible venues. The first would be the Senate asserting its constitution given duty and right to retain its powers of advice and consent. 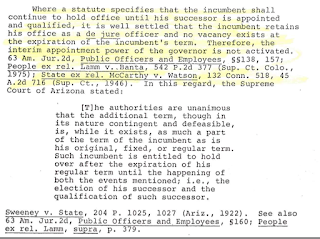 The second is the right of any individual to start a quo warranto proceeding (Chapter 659) to petition the court to order Tom Gorack to state the authority under which he can claim to be a PUC commissioner. 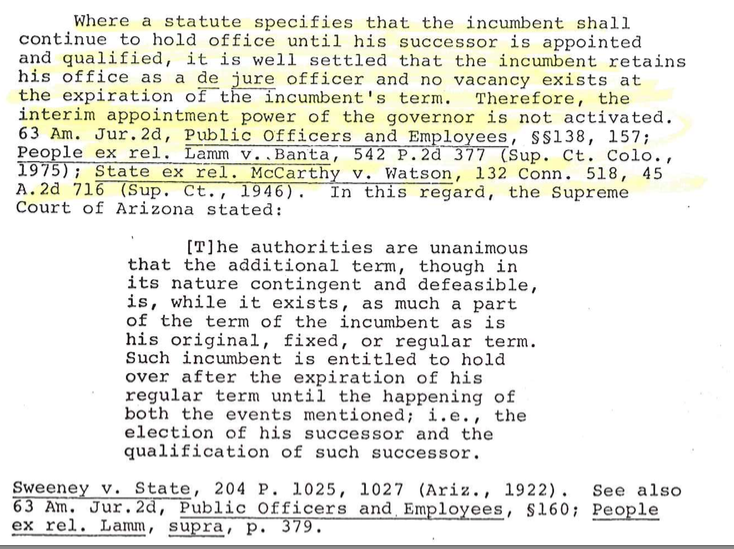 Here, it appears to be well-settled that given the language of the PUC statutes, that as a hold-over, Commissioner Mike Champley, who has been physically locked out of the PUC but has not resigned, is the de jure officer, that is someone who is legally entitled to the office as clarified in Attorney General Opinion 73-7. Several weeks ago I wrote a post entitled "Searching for Prudence" to help understand the role and responsibilities of the PUC. The independence and integrity of the PUC is at stake and it is now a search for justice, an exercise to strengthen democracy through the separation of powers and respect for the rule of law. Will facts, logic, reason and the rule of law prevail or will we succumb to an abuse of power making Hawaii look like some Podunk republic open to backdoor politics. If the later and this fiasco is "local values", then we should be glad NextEra doesn't have it.